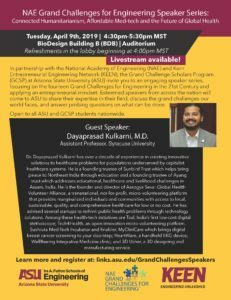 In partnership with the National Academy of Engineering (NAE) and Kern Entrepreneurial Engineering Network (KEEN), the Grand Challenge Scholars Program (GCSP) at Arizona State University (ASU) invite you to an engaging speaker series, focusing on the fourteen Grand Challenges for Engineering in the 21st Century and applying an entrepreneurial mindset. Esteemed speakers from across the nation will come to ASU to share their expertise in their field, discuss the grand challenges our world faces, and answer probing questions on what can be done. In this talk, Kulkarni will focus on the Grand Challenge of Engineering Better Medicines with a global perspective within the theme of health. 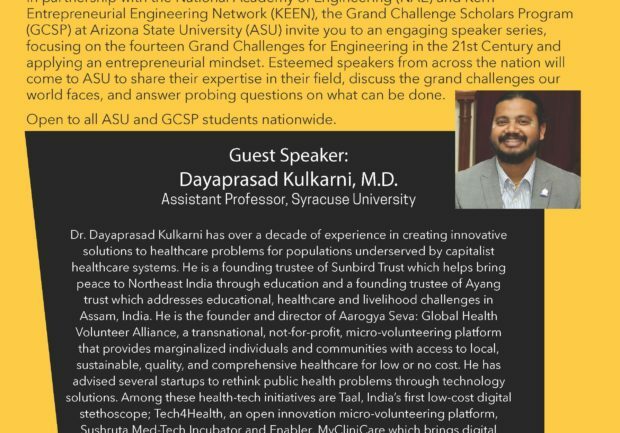 Dayaprasad Kulkarni has over a decade of experience in creating innovative solutions to healthcare problems for populations underserved by capitalist healthcare systems. He is a founding trustee of Sunbird Trust which helps bring peace to Northeast India through education and a founding trustee of Ayang trust which addresses educational, healthcare and livelihood challenges in Assam, India. He is the founder and director of Aarogya Seva: Global Health Volunteer Alliance, a transnational, not-for-profit, micro-volunteering platform that provides marginalized individuals and communities with access to local, sustainable, quality, and comprehensive healthcare for low or no cost. He has advised several startups to rethink public health problems through technology solutions. Among these health-tech initiatives are Taal, India’s first low-cost digital stethoscope; Tech4Health, an open innovation micro-volunteering platform, Sushruta Med-Tech Incubator and Enabler, MyCliniCare which brings digital breast cancer screening to your doorstep; HeartWare, a handheld EKG device; WellBeeing Integrative Medicine clinic; and 3D Usher, a 3D designing and manufacturing service. Refreshments in the lobby beginning at 4 p.m.